This digital sound device produces the classic deep dual tones. 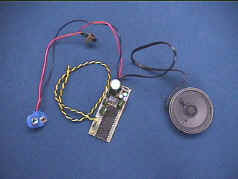 The sound is activated using a servo arm which swings to make contact with a momentary switch. Servo not included. -Runs on 6 to 12V.